The new PackTite Closet Heater has finally arrived after months of speculation that a new larger model was in development. We had a chance to review the new PackTite Closet and wanted to share our thoughts. The first generation PackTite launched in 2009 and was the first of it’s kind used to treat personal items such as suitcases, clothing, shoes and bags in a controlled heat box. Bed Bugs are effectively killed with sustained heat above 117 degrees fahrenheit making the PackTite as bed bug killing machine. 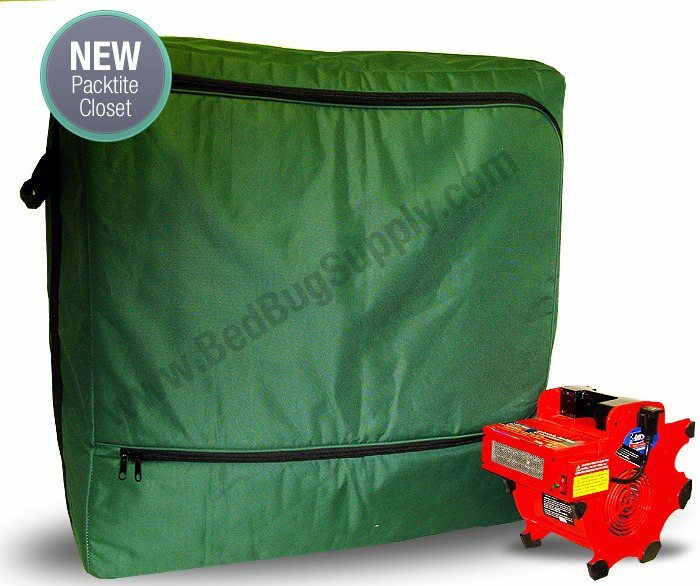 This unit is of course still available today and has worked well over the years for frequent travelers, those treating an infestation, retailers (to treat returns) and just about anyone looking to treat items that may have been exposed or infested with bed bugs. Limitations to the first generation PackTite was only space, which limited it to travel size suitcases. The new PackTite Closet is a considerable larger PackTite with several key new features that set the unit apart from its predecessor. One of the key differences is the heater, which installed outside the unit as opposed to inside. This increases the usable inside space and also fills the PackTite up sort of like bounce house further increasing the usable interior space. The PackTite Closet starts out at 18″ L. x 36″ W. x 34″ H., but then expands once the heater is turned on to 30″ L. x 40″ W. x 36″ H. The new heater is also more powerful reducing the time needed to heat up. Another key feature is the larger usable space allowing it to treat most sizes of suitcases. With the larger usable space, you can also treat more items using fewer cycles. This can be especially helpful when treating large amounts belongings in a short period of time. One of the most interesting features to be offered on the new PackTite Closet is clothing rack allowing the user to hang up clothing as opposed to piling clothing on top of each other. This greatly reduces the treatment time as well as keeps clothing from becoming wrinkled. Those that have a lot of dry clean only clothing will certainly enjoy this! To ensure that the temperature has reached the optimal killing point, the new PackTite Closet comes with multiple gauges. This helps make sure that each part of the PackTite has reached the correct temperature.